Here on Bloke in the Kitchen we don’t go in for canned stuff much, but in this case what we’re using tastes fresh and is mixed with fresh things, so why not? This recipe is dead easy and the result delicious. So we’re having it on its own, with tortillas. That’s the thin, flat, pancake-style bread tortilla, not tortilla chips (Doritos), although you could use them if you like. Normally you would decide on the main part of the dish: the meat, fish or whatever, and then think about what to have with it, but with this one, it’s a star in its own right, so if you want to serve it with some protein, that’s fine, but on its own is fine too. 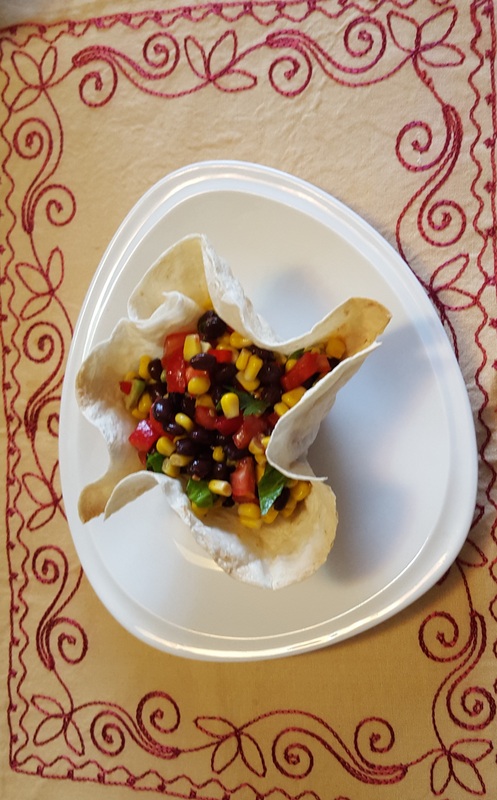 You can buy packs of tortillas and use them just as they are, or put them in a hot oven for a few minutes and make them into ’baskets’ so you can fill them with the salad. So you have a soft wrap-style unit or a crisp, edible container. Open the cans and drain them. 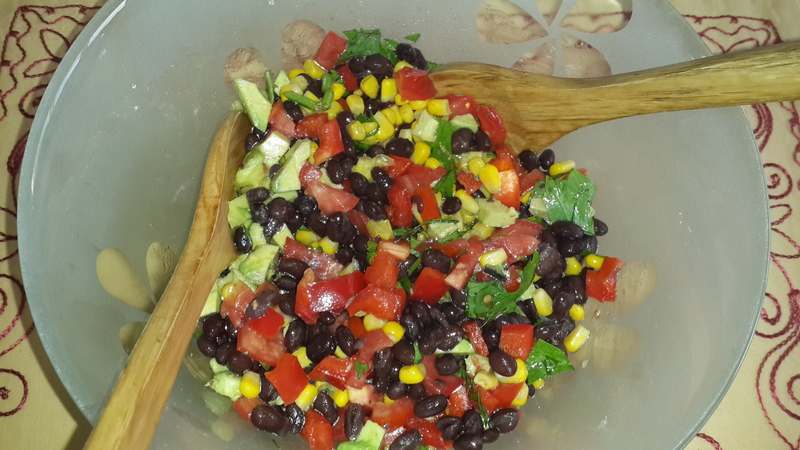 Put corn and beans in a salad bowl. Chop the red pepper into small pieces and add to the bowl. Chop the tomato(es) up fairly small. Because they’re full of juice and seeds they will fall apart, but that’s okay. Chop the cilantro and mix it in. Chop the avocado into half-inch cubes and add to bowl. Cut the lime or lemon in half and squeeze it over the mixture. Pour on a little olive oil – just a glug or two. You don’t want it awash with oil, just to have everything glistening. Mix it up – with your hands or salad spoons etc. Taste it and add more oil or juice if required. You want to get a lot of juice out of the fruit, so one option is to lean on it heavily and roll it, which should weaken or break up the little pouches of juice inside. You could use bottled juice, but it really isn’t the same – it’s more acidic and less sweet. If your squeezing grip isn’t that strong, put your hands together, linking the fingers, get the halved fruit between the heels of your hands and squeeze with both arms. Or, of course, you might have a juicing contraption in the back of a drawer somewhere. If it needs a little salt, give it some, but only a little. The citrus should liven it up sufficiently. If you’re crisping the tortillas, heat the oven to 200. Take an empty can such as the ones that contained the beans or corn you’re using. Remove the label, wash the can and stand it up, open edge down. Run some water over the tortilla and put it on the can, smoothing it down with your hands. There will be folds, which will look good when it’s cooked. Place tortillas (still on the cans) in the oven, at the bottom, and give them 10 minutes. Check to see they’re not burning and are crisping up. When they’re done, remove the cans and use the tortillas as baskets for the salad, so you can pick them up and eat them like that. Hi, Just An Opinion. I think you have commented before. Trouble is, I can’t see your comments. Why do you think that is?